*And I don’t mean that as a bad thing at all. It’s just all so perfectly pristine and I mean, look at her waist. I’d totally love a Curious Creations doll play set. 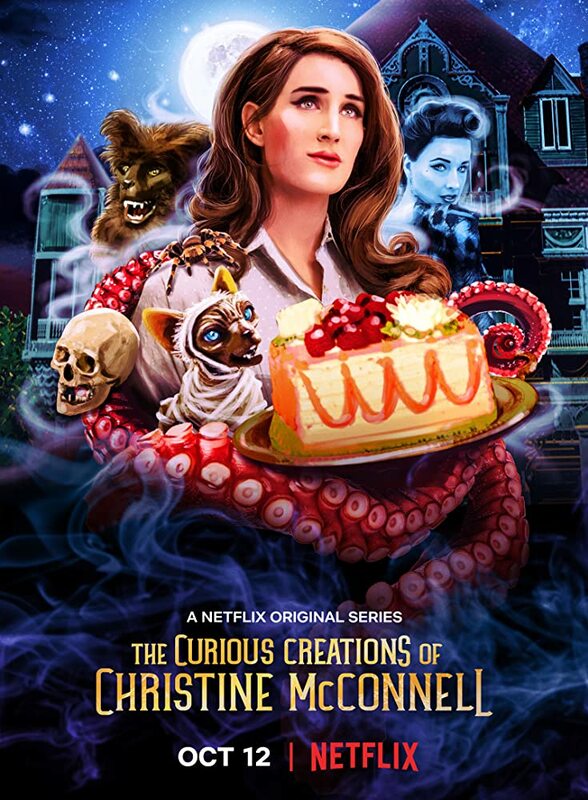 When a friend first sent me a recommendation for Netflix’ shiny new Goth foodie miniseries, The Curious Creations of Christine McConnell, I was intrigued – the premise wandered weirdly on the fine line between reality and the realm of the fantastic (one of my favourite lines ever!) so I wasn’t quite sure what to expect when I pressed play a few days later. Curious Creations indeed veers between scripted storyline comedy and cooking show where the host plays an exaggerated version of herself. Christine is a burlesque Martha Stewart-meets-Morticia Adams beauty, impeccably dressed in beautiful vintage. 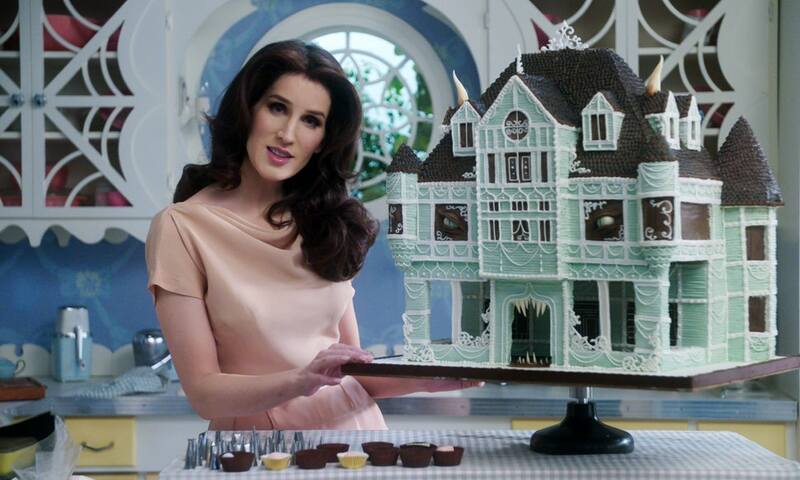 She floats through her ornate mansion like a dark Disney princess, gentle, pale, fragile and beloved by all her little friends. These little friends are, naturally, not adorable mice in hats nor tiny birds (the only time a tiny bird makes an appearance it’s already dead). Instead, Christine lives with cat mummy Rankle (who would like to remind you that he used to be worshipped like a god), a furry monster in the basement and a less-than-clever werewolf, among others. Rose, the depraved, perverted frankenstein roadkill creature will burn herself into your retinas and memory, for better or for worse. None of these housemates are particularly helpful, the tentacle monster in the fridge and the ghost in the mirror aside. The latter is played by Dita von Teese and at least gives fashion advice. Norman, on the other hand, is perfect. Christine’s love interest (whom she meets while bringing a picnic to her Grandmother’s) is exactly the kind of over-the-top happy 50s guy you’d expect as an extra of Pleasantville. He wears plaid, Buddy Holly-ish glasses and an exaggerated, toothy smile with the loveliest dimples. Who cares if he smells like fresh blood, right? The Curious Creations themselves though balance the sometimes slightly repetitive comments from (and about) Rose – they are STUNNING. Christine McConnell might not be a professional pâtissière but makes up for it with her impressive skills in the design department. Most of the projects are impossible to make in just an afternoon, so all we get to see are a few details and hints how to go about it should we ever decide to go megalomaniac and attempt something similar ourselves. Each episode features small projects, too, though. Christine covers about everything from baking to nut-based spiders to dress- and candlemaking and does so with a great sense for aesthetics. No wonder she did promo for Tim Burton. Alas, this wouldn’t be an honest review if I didn’t include the next bit. I admit that I’m not quite sure if this fault is original to the program or rather something that can be attributed to the format it makes fun of – the scripted casuality of very American, very white-toothed cooking and crafting shows. At times (not always!) the whole thing seems… stiff. Rehearsed. Over-pronounced. A tiny bit too slow, moments that are drawn-out just a few seconds too long. Lovingly scolding glances from Christine to her critters in particular. Maybe it’s because the “look, we’re adorably psychotic” thing wasn’t my favourite with Wednesday Adams, either. Maybe it’s because I find Rose more grating than likable. Or maybe I’ve just seen too much not-so-great puppetry-supplemented children’s TV. I think what I want to say is that it’s either too much, or not enough. With the right timing and something to make it more visibly over the top it would work out just a tiny bit better. The series doesn’t shy away from being camp, so why do it script-wise? Get me some old-fashioned cliché dialoge! Hell, give me screwball! It’s vintage! It fits! But that’s about the only real issue I have with the entire thing, and I’m picky, so it barely counts. To sum it up, it’s reminiscent of the Fullerverse (much like Mockingbird Lane meets Pushing Daisies) with a generous dose of Burton mixed in and some extra vintage cherries on top, and it’s mostly about food, so I’m in. It’s so very aesthetically pleasing, I hope it’ll get a second season. Maybe with more recipes (or at least links to a recipe collection – on the other hand I could buy Christine’s book for that). But that’s just wishful thinking, and it’s pretty good the way it already is. Have you watched The Curious Creations of Christine McConnell? How did you like it, and what was your favourite creation? And who’s your favourite housemate (mine’s Bernard, but only if Norman doesn’t count)? All pictures except for the first via, and they belong to Nexflix.